China’s first home-built large passenger jet glided into Shanghai skies on Friday, a breakthrough in its soaring ambitions to launch a new era in aviation and upend the dominance of American-produced airplanes. 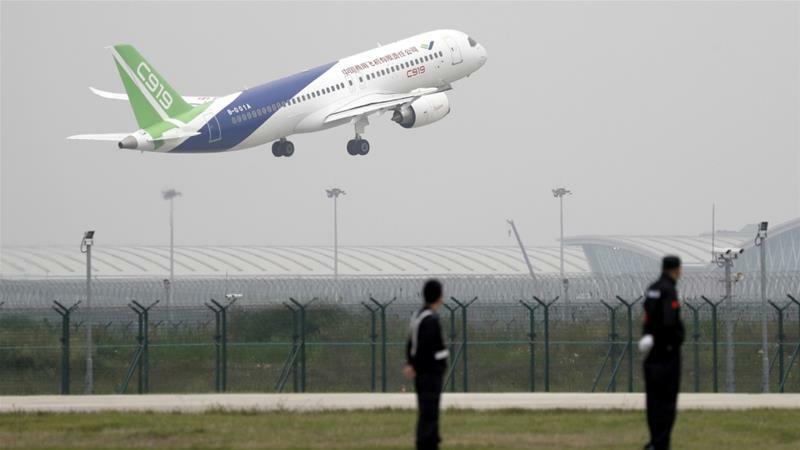 Spectators crowded onto the tarmac and cheered as the green-tipped C919 jetliner rumbled down the runway at Pudong International Airport and disappeared in the smoggy air. China Central Television showed the broadcast live, including two pilots in the cockpit clad in bright orange jumpsuits. More than 1.4 million people watched the flight through the news organization’s social media account. The plane won’t go into service for at least two years, and it will take even longer before it comes close to matching industry leaders Boeing and Airbus. But the maiden flight represented something else: China’s ascendance from an impoverished nation once dependent on factory output to a sophisticated leader dedicated to high-tech advancement. Friday’s takeoff occurred the week after China launched its first domestically built aircraft carrier. This hands two significant victories to President Xi Jinping, who is seeking to cement his legacy before a Communist Party leadership shuffle this fall. His “Made in China 2025” plan aims to enhance domestic production through innovation. Comac describes the plane as “the flower” and “pearl” of modern manufacturing. The company chose the number partly because the word for 9, jiu, also means everlasting. The 158-seat aircraft, intended for medium-haul flights, took more than a decade to plan and complete. Officials designed it to compete with Boeing’s 737 and the Airbus 320 in a market they’ve long controlled. It’s a lucrative one. China’s middle class continues to expand and desires vacations to Thailand or business trips to Texas. Boeing estimates single-aisle planes like these will generate about $535 billion — 75% — of passenger jet sales in China within the next two decades. Comac says it already received 570 orders from 23 customers, although most of these are domestic companies or ones with ties to Chinese businesses. Boeing has President Nixon to thank for China’s infatuation with its airplanes. He flew a Boeing 707 on his historic visit to Beijing in 1972; the Chinese later purchased 10. Xi made a point to stop at Boeing’s headquarters two years ago on a trip to Seattle and purchased 300 jets. China’s reliance on the industry giants won’t change any time soon. Comac needed the assistance of Western suppliers to build the jet. General Electric and French aerospace firm Safran supplied the engines. Others, like Honeywell, offered up parts for its belly or cockpit. U.S. and European safety regulators also need to certify the jetliner before it can operate much beyond China. The country’s first homemade plane, a smaller, clunky regional jet called ARJ21, waited eight years between its initial fight and the summer day last year it went into service. Demand will only increase. China is expected to surpass the U.S. as the world’s largest air travel market by 2024, according to the International Air Transport Assn. Beijing’s international airport, a sprawling, high-ceiling edifice, already ranks second busiest in the world behind Atlanta. Even for some in China, it’s hard to let go of the airplane standard.